Samoyed dog breed proved to be a precious companion for it owner. Among the breed, duties are pack hiking, tracking, and warming their owners by sleeping on top of them at night. As a working breed, Samoyed can be strong will sometimes, but above all they remain friendly, gentle, and dedicated family dogs. The Samoyed’s fondness for humans probably stems from his close association with the Samoyed’s (now known as the Nenetsky), people who bred and raised him thousands of years ago on Taimyr Peninsula of Siberian. The dogs pull sleds, herded reindeer, hunt game, and protect the Samoyed from predators. The dogs also lived with people, played with children (which he still enjoys) and helped keep them warm in cold climates. To this day, Samoyed's reputation as a smart, friendly, and familiar dog is worth it. He often chooses to dote on a special person in the family but is affectionate with everyone in the pack. Happiest when he is part of family life, this breed needs to be with people. In fact, leaving Samoyed alone is the best way to make him miserable. Along with his smile, Sammy's defining trait is his very thick white coat. In the winter months, it is very dense that you can barely see his skin underneath - which means heavy shedding in the spring. Believe it or not, Samoyed "wool" is preferred by weavers, the wool is carded, spun, and woven or knitted into warm, beautiful clothing. As beautiful as it is, Sammy's coat is a bear to groom. The owners must be diligent brusher to make sure it doesn’t tangle and mat. As you can guess, come shedding time, the amount of white hair around the house, the patio, the furniture, and stuck to your clothes can be overwhelming. However, for the owner who can handle liability, a well-groomed Samoyed is a sight to behold. As friendly and intelligent as this breed is, Samoyed is a challenge to own. The dog can be a talkative dog, voicing his likes and dislikes howls, bellows, or barks. It is best to keep this dog busy, otherwise, he will likely resort to annoying or destructive behavior such as digging. Samoyed loves to be held and pampered and will often let you know by moving his body closer to you for better access, jumping and begging you to be picking him up. Some dogs may be less blunt in their display, but Samoyed does signs such as whining, barking, leaning or standing up against you, pawing at you or just coming into your space and making eye contact. Once he is picked up, this dog will enjoy being held and will often stay relaxed in your arms and some may solicit petting. 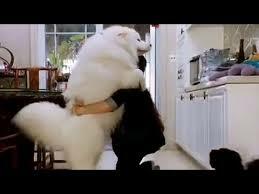 Watch this amazing video of a Big Fluffy Samoyed being carried. DoglopedixSamoyed dog breed proved to be a precious companion for it owner. Among the breed, duties are pack hiking, tracking, and warming their owners by sleeping on top of them at night. As a working breed, Samoyed can be strong will sometimes, but above all they remain friendly, gentle, and dedicated family dogs.